There are many wonderful people working with our children at Angels' Place. Here is a chance to meet one of them...Mary Donthianmawi, Nurse and Supervisor. Mary's job is to take care of the children's physical and mental health as well as provide guidance in their daily lives. Her role is extremely important because of the challenges many of them face coming from very poor families with little or no access to healthcare. Most of them have been largely neglected by caregivers who were barely able to care for themselves. Some had no caregivers at all. Mary faces many challenges when working with children from such difficult circumstances. Motivating some of the kids is not easy but with consistent loving care and a good dose of patience, she has been very successful, even with some of the toughest cases. Mary finds tremendous reward in helping these troubled kids blossom into healthy thriving young adults. In her own words..."I love helping the orphan children in whatever way I can. Giving medical care, helping with their studies and teaching them right from wrong." Mary is an invaluable asset to Angels' Place. Not only does she provide the routine healthcare the children need, but she also provides the emotional support and structure required for them to flourish. We are very blessed to have her as a member of our team caring for all our precious Angels. Look for more "Inside Angels' Place" stories coming soon! If you want to meet some of the amazing children Mary works with, click on "Angel of the Week" under categories to the right of this page. To learn what you can do to help more kids find a home at Angels' Place, visit our Ways to Help page. Meet Lunkim (known as Kim by her friends and family), one of the youngest Angels living in our orphanage. She is a sweet little girl from the small remote village of Kangkap. You would never know behind her smiling eyes and cheerful personality there hides a story of sadness and hardship many of us could never imagine. She is one of the lucky few who got into Angels' Place. There are hundreds just like her still waiting with no family to take care of them. Waiting for a sponsor or donor to help us make room for them. Kim came to Angels' Place this past February after her father died from cancer. Her mother, like so many young widows in India, was left destitute and could not care for her children. Kim remembers how difficult her life was and how she was so often sick. With with no access to quality medical care in these small villages, children like Kim often suffer needlessly. The very sick often don't make it. 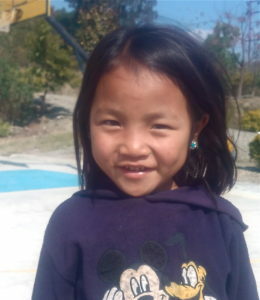 Today, thanks to her sponsors, Kim is a healthy, vibrant and happy little girl who loves to play with her new friends and sing and dance with the performance group. She is getting the medical care she needs, healthy nourishing meals and a warm bed to sleep in. Most importantly, she is surrounded by a loving community of adults who want her to thrive. Thank you to our sponsors and donors who make it possible for children like Kim to escape the ruthless grips of poverty. Please, help us spread the word so we can make room for the hundreds just like her still on our waiting list. Visit our Ways to Help page to learn how you can help us reach more potential sponsors and donors. To read more Angel of the Week stories, click on Angel of the Week under "Categories" to the right of this page. When Jan (our founder and Executive Director) visited Angels' Place in March, he had the opportunity to interview some of the kids who had graduated and left the orphanage. Here is what he learned, in his own words, about one of our many success stories: Lalbiakmuan! "Biakmuan (as he is known by friends and family) impresses everyone with his hard work and enthusiasm for everything at Angels' Place. If its singing in the chamber group and the senior choir or concentrating on his lessons Biakmuan excels in attention and interest. He played soccer, volley ball and basketball at Angels' Place. 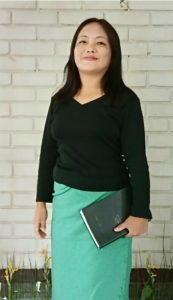 Biakmuan graduated from Angels' Place this year having completed class 12 at Rayburn College High School. 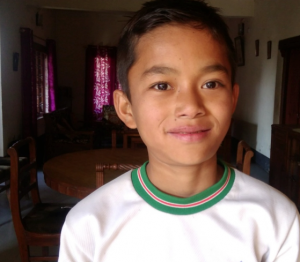 He wants to go on with his education either at the Imphal School of Preaching or at a local college. He kept above average grades and passed the state exam to pass class ten and go on to classes 11 and 12. Unfortunately, he cannot afford to go on to college yet. He went back to live with his father in the country where he now works as a laborer to support himself and his father. His younger sister is still at Angels' Place. He had many reasons to like living at Angels' Place, the friends, the organization, the discipline (Yes, he said he liked the discipline! ), the education and the activities, especially the singing. He became a Christian and now preaches at his home church. He will continue to work to further his education and be a positive and productive member of his community." It is only through the generous support of our donors and sponsors that we are able to help kids like Biakmuan break free from the crippling grips of poverty and lead successful productive lives as adults. We have hundreds on our waiting list hoping for someone like you to help make room for them at Angels' Place. Visit our Ways to Help page to learn what you can do. Meet Manglunthang, or Thang, as he is known by his family and friends. Thang lost his father in 2017 and when his mother remarried soon after he was sent to live with his grandfather. Unfortunately, his grandfather was too old to care for the needs of growing children so he came to Angels' Place. His caregivers remember a shy reserved child when he first walked through the doors of the orphanage with his younger sister. They were alone, forgotten and traumatized by a life of hardships: being raised by an abusive alcoholic father, losing their father to liver disease, being abandoned by their mother, all on top of the extreme challenges of growing up in poverty. It is no wonder Thang was so withdrawn. In his own words: "My life was very hard." Today, Thang is thriving at Angels' Place. His caregivers describe him as a cheerful and friendly young man who is quickly overcoming the emotional obstacles to his success. Thang appreciates the "friendly atmosphere" at Angels' Place and loves playing football with his new friends, listening to music and drama. One day he dreams of becoming a "good" police officer and thanks to the education he receives now, this dream is a real possibility. He is no longer destined to repeat his father's tragic story. Thang wants everyone to know how grateful he is to his sponsors who have made his transformation possible. Because of their generous support, he is getting everything he needs to build a successful life for himself and become a healthy and productive member of the community. There are hundreds of children just like Thang on the waiting list to begin their transformation at Angels' Place. You can help make room for them by visiting our Ways to Help page.